Moraine Park with Elk, Rocky Mountain National Park – KeaPOD 23 | KeaNeato! 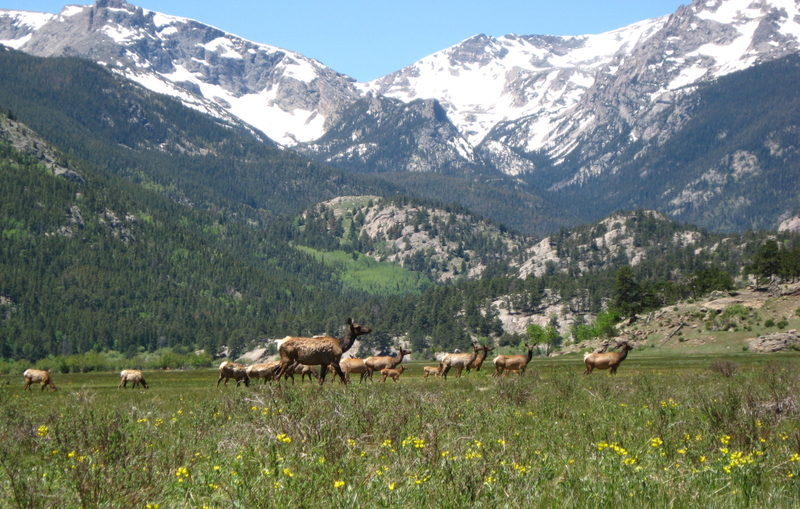 My favorite place in Rocky Mountain National Park, Moraine Park, with a herd of female and juvenile elk moving through (14 June 2008; photo by keagiles). Rocky Mountain National Park in Colorado, USA, is just an hour’s drive from my home. How lucky can I be, right? I don’t spend as much time there as I would like, but when I do go, I always stop at Moraine Park (not the campground, but the valley itself, with its beautiful meandering stream). Back in June 2008, I was lucky to be able to photograph this scene (though from a ways off). Click on the photo to elklargify*. I have quite a few photos from Moraine Park, and I think the place is pretty neato, so I’m reminding myself here that a full RMNP Moraine Park post is in order in the near future. *Thanks to Bad Astronomer Phil Plait for giving me the inspiration to make up funny photo zoom names. This entry was posted in beautiful, POD (picture of the day) and tagged Colorado, elk, meadow, Moraine Park, Rocky Mountain National Park. Bookmark the permalink.